When Bill and I first got together nearly 30 years ago, we moved almost every 18 months. No, not because the rent was due but because job changes within the same company for me required it. With all of that packing and unpacking we came to an agreement that if we had not used something within the last year then it was not going with us to the new location. I think that we’ll be invoking that rule and a companion one as well, especially once we’re in place. No, it’s not Christmas yet; in fact, it’s still summer but this title refers to being in-season as in what fruits and vegetables are available from farms nearby now. One of the advantages of living in France, or in Europe in general, is the availability of markets that feature locally-grown produce. When we were in Normandy, northern France, this past May, it was cauliflower harvest time and for about $1 you could get a giant head weighing up to 4 or 5 pounds each. Who knew that there were so many ways to cook a vegetable and have it turn out so tasty: steamed, baked, roasted, sauteed, pureed, stir-fried, raw with dip, and turned into soup. There may be many more but these were the ways we tried with this one vegetable and today we’re getting more practice with another. Our little square-foot garden beside the house has been amazingly prolific this year, sometimes with volunteer plants that popped out of the compost on their own. Here you can see some of the bounty of butternut squash that came from just one vine. What you don’t see are the squash that we earlier gave to neighbors or already ate ourselves. We’ll be making these remainders into soup thanks to a recipe from our favorite Do-Ahead Diva, as she’s nicknamed, Diane Phillips. Her concept for entertaining is to get all the food prepared well in advance so that once the guests arrive you can spend the time with them rather than in the kitchen. I guess we’ll be taking her cookbooks with us. What a question, huh? In our quest to use up the foods that are still here in the house in what we call “shopping the pantry” I came across a box of tapioca, part of which Bill had used quite some time ago when making a fresh cherry pie. I don’t really remember the pie but I know that he didn’t make the tapioca into pudding since he detests anything with a consistency like bread pudding, rice pudding, or custard of any sort. After I told him what dessert was going to be, Bill went rummaging through the shelves and returned with a box of Jello®. Clearly I certainly was not going to eat that since it was left over from that horrible night-before cleanse required for a colonoscopy. That’s one of those experiences where the bark truly is worse than the bite since once the anesthesia hits you don’t feel or remember anything, thank goodness. The odd thing about this pudding vs. gelatin battle is that we almost never eat dessert but this contest will continue since the shelves aren’t empty yet. Where is a tarte tatin or a fluffy chocolate souffle when you need one? After a month of writing and rewriting posts, trying various layouts, finding or taking appropriate photos, and figuring out what widgets we wanted to use, we launched this blog yesterday with little fanfare but much praise. Thank you so much to all of you who have already said such nice things about the blog and good wishes for prosperity in our new home. But it’s not just this blog that’s come alive. 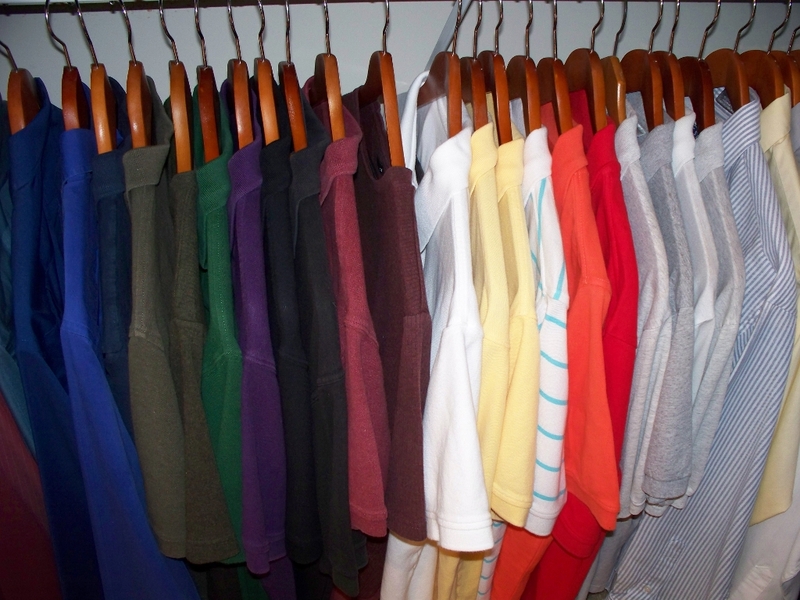 Take a look at this photo of my closet and tell me if you can spot the difference between one side and the other. Yes, our clothes closets have taken on a life of their own as well. When we travel in Europe with our friends Cathy, Jane, Kate, and Paula, we are known collectively as the “Men in Black” by our French friends and you can see why from the second photo as we are walking toward a Loire Valley château on a cool and cloudy early spring morning. Now that we’ll be moving to the south of France known for its 300 days of sunshine each year, our wardrobe was in need of an update. To go with our new locale you’ll be able to detect bright clothes and even brighter smiles. Now that you know where some of this motivation for learning other languages comes from, I’d like to talk about what we are doing to learn French. For me it started back in high school where, after 3 years of classes I could flawlessly repeat the first lesson we ever learned which started out with “Bonjour, Jean. Comment vas tu?” and continued on with other basic questions, replies, and a request for how to find the library. All of that and nothing more. Fast forward about 20 years when Bill and I were taking language classes in Germany and met our wonderful French friend, Michèle who invited us to visit her country on our next European trip. Motivation to learn the language for sure which increased tremendously when she married her husband who spoke only limited English. Foreign languages have never seemed all that “foreign” to me, fortunately, at least in the sense of the desire to learn them. In the Peace Corps in South America I learned Spanish in the total immersion sink-or-swim method of living with a family of 12 who spoke no English. Language classes in the day were followed by interaction, meager at first, with the family at night. I still remember that moment at dinner one evening when I realized that I could understand some of what they were saying and asked to be included. From then on I was truly a part of the family.